In the beginning (of New Music New College) there was Cage. 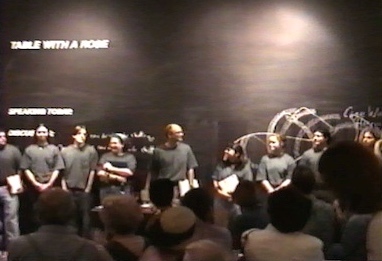 Before we even came up with the name "New Music New College" Sarasota's Ringling Museum of Art asked New College professor Stephen Miles to perform Cage's Song Books as part of the museum's education outreach activities centered around an exhibition of multiples by artist Joseph Beuys. The Song Books are a collection of ninety solos, classified as either songs, songs with electronics, theater, or theater with electronics. Any number of them can be performed, in any order, by any number of performers. Some use a purely graphic notation, some are fully notated but vary depending on choices singers make during performances, and still others depend upon chance procedures for their realization. The open-endedness of their structure, the wide range of activities described by various songs, and the rich themes explored (including, but not limited to references to Thoreau and Satie) all make for a grand palette of experiences for both performer(s) and audience. After that first eye-opening performance we realized that our decision to stage the Song Books spread throughout the space and with a freely moving audience was not simply novel, but appropriate for the composition, as it extended the agency given performers to the audience themselves. We staged the Song Books again in November of 2010, and once more we encouraged the audience to form their own experiences. This time we staged the piece in the three ground-floor rooms of New College's College Hall, the former mansion of circus magnate Charles Ringling. Again the singers (Bret Aarden, Christina Martin, Caitlin McMullen, Stephen Miles, R. L. Silver, and Sara Stovall) and technicians (Bryce Bresnan, Caegan Quimby, Brendan Rivers, and Tyler Whitson) used stopwatches to time their movements to the second for the one-hour performance. For these performances Stephen Miles created a focal point halfway through, with all of the performers moving into the College Hall Music Room and singing the same song (number 48), but starting at different moments. Silver, instead of singing, played Cage's Winter Music on the piano, assisted by Bryce Bresnan, who held down additional keys. About a week after the two performances in College Hall we adapted the performance and presented it in several rooms of the Searing Galleries of the Ringling Museum (galleries not yet built at the time of our 1998 performance). So in a way we were returning to NMNC's roots. If you have access to Project Muse you can read Stephen Miles's paper "Seeing Cage, Hearing Beuys" in The Drama Review about the intersection of the visual art and music during the 1998 Song Books performance here.